50. Water resources management mostly follows an Integrated Water Resources Management approach. The Development of River Basins Management Plans in EU member countries, and adoption of the Integrated Water Resources Management (IWRM) approach to water resources management and flood protection dominates throughout the region, consistent with WFD requirements. Preparation and implementation of those plans are generally under the responsibility of the line ministry responsible for water management (which is in most of the countries the Ministry of Agriculture, but in some countries also the Ministry of Environment). 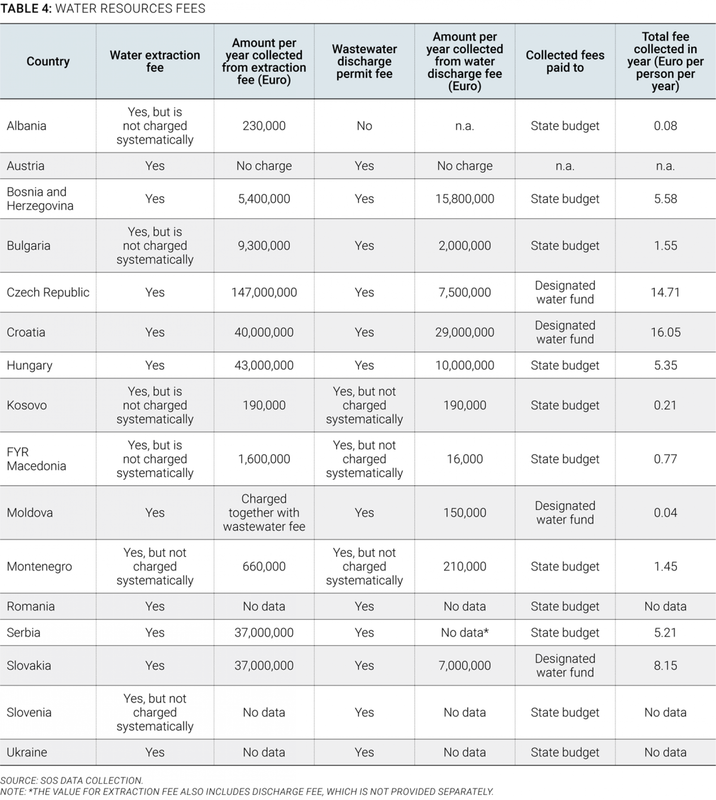 A few countries, such as Croatia, Bosnia and Herzegovina, Hungary, and Serbia, have established national state water agencies with significant water resources management responsibilities. As mentioned in Chapter II, Section D, those plans are then made consistent with the Danube River Basin Management Plan under coordination of the ICPDR. 51. While legal, the actual use of water extraction and wastewater discharge fees is not commonly an effective resource regulation instrument. The concept of water extraction and wastewater discharge licenses and fees exists in all countries of the region, but some countries do not charge extraction fees, while others do not fully enforce them. Funds collected from such fees are in most cases income of the central state budget (with the exception of Croatia, the Czech Republic, Moldova, and Slovakia, where they are channeled into a designated water fund), from which they are distributed according to government needs. The amounts collected range from mostly symbolic in Albania to relatively significant in Croatia and the Czech Republic, but remain very small on the regional level (the regional average is only €4 per person per year) and do not exceed €20 per person per year in any country in the region (Table 4). Only four countries (Bosnia and Herzegovina, Croatia, Moldova, and Serbia) have independent state water agencies with a certain level of responsibility for water supply and sanitation provision services, and only in Croatia does this agency (Croatian Waters) have substantive responsibility and an adequate budget for all aspects of the water sector. The budget of Croatian Waters (€310 million or €70 per capita in 2014) is mainly generated from different fees collected from all water users in Croatia, and receives little or no financial support from the state budget.